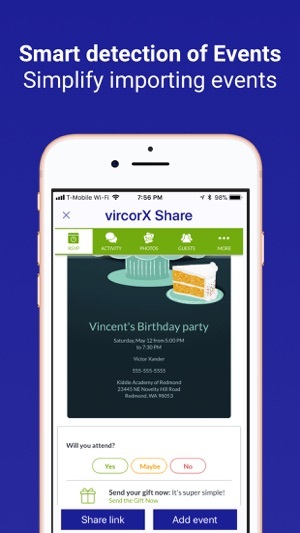 vircorX is an integrated messenger and organizer for family and friends. You can establish relations with people you know or form groups. 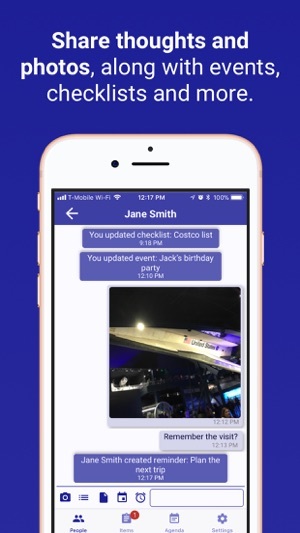 Create checklists, events, reminders and notes for either yourself or to share with people or to your groups. • TALK TO APP: Use speech commands to control the app. Say name of person to chat, or "event" to create event, "Add Bread" to add add Bread to checklist, "Date" to change date of event, "items" to switch to items tab etc. • RETHINK EVENTS/REMINDERS: vircorX sheds the legacy of corporate world calendars. 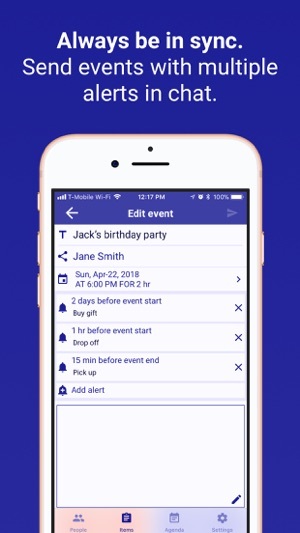 You can set multiple reminders on events (Pick gift, drop the kid at party, pick up kid after party), reminders with different times for days of week (For early end of day of kid on say Wednesday), or multiple times for the same day (9AM and 5PM for medication). You can share these events/reminders with any of your relations/groups. No more trying to hack calendars. 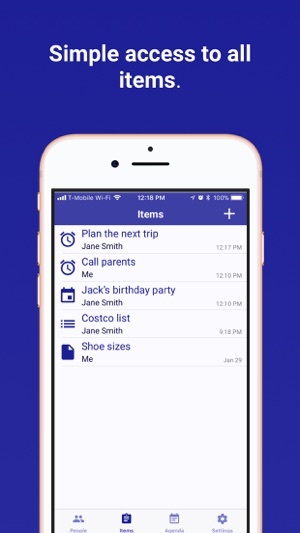 • CHECKLISTS: vircorX lets you share checklists which serve as a todo list or a shopping list or what to pack for your next vacation. Anyone it is shared with can view and edit it. • SHARE FROM ANY APP: With share extension, now you can share photos, weblinks and text to anyone on vircorX. As bonus, vircorX can recognize if link is an event and prompt you to add it as event. • NO USERNAMES AND PASSWORDS: vircorX uses phone number or email for signing in. Just enter your phone number or email and enter the verification code received through SMS or email. Voila, you are signed in. • FIND PEOPLE USING PHONE NUMBER/EMAIL ADDRESS: You can add multiple verified emails/phone numbers to your account. Your family and friends (relations) can find you using phone numbers or email addresses you have added. No more which Jack or Jane is the one. • YOU ARE IN CONTROL: People can not share anything with you till you accept their invite. You can always delete the chat thread to stop their messages/shares. It is that simple. • TO SHARE OR NOT TO SHARE: You can create events, checklists etc either for yourself, or share with a relation or in a group. If shared, all changes are visible to everyone and everyone can edit. You can chat with a relation, in a group or you can even chat with yourself (talking to yourself helps!). • NOTES: Just plain notes. Write anything and share. It could be a recipe, it could be quotes, it could be kids shoe sizes. It is wet clay, shape it as you want. I use the VircorX family organizer app regularly. I particularly love the newly added 'importing evite' feature. I get so many evites and it has always been tough to manage and keep track of all them in one place. 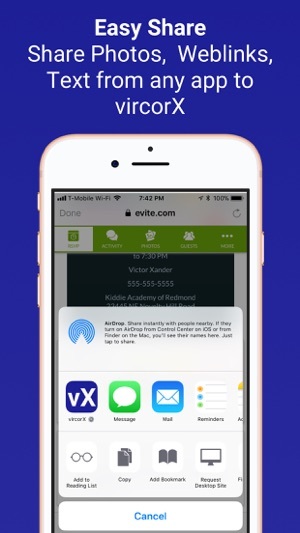 With VircorX app I am able to easily import all my evites and the app takes care of the rest. I can view my events/evites in a single place, VircorX sets default reminders for me and I can easily add or change event reminders as well. And whats awesome is that I can share my events with family members and friends! My days feel so organized with VircorX! 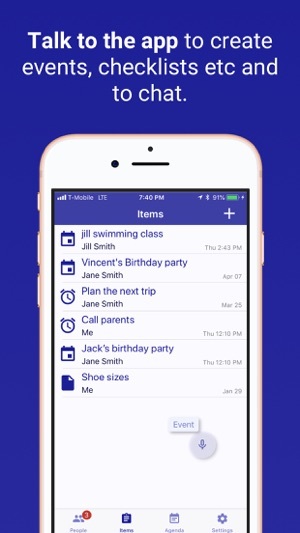 A really cool family organizer app. My husband and i use it very regularly and find it super useful to manage our family events. send chat messages as well as share or update my events/checklists etc in the same chat window. Loving this app!! 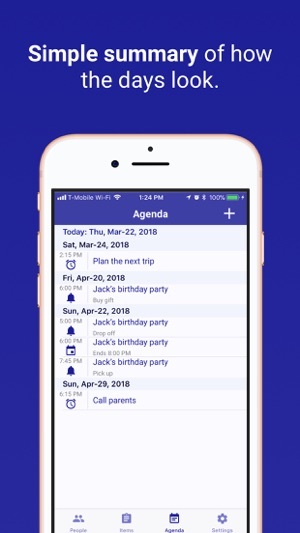 I like the fact that it integrates multiple capabilities into one so that my family does not have to switch between a list app, a messaging app, and a calendar for day to day activities. Also the ability of multiple reminders leading up to the actual event is a good one.